Because we're so looking forward to springtime, we really wanted to make a fall staple, short ribs, a little lighter and livelier. We turned to the elements of Korean BBQ: soy sauce, garlic, sesame, scallion, as well as the peppers, ginger, cinnamon and sugar in Old No. 1, but used Boise Brewing's Snowboarder Porter as our braising liquid. We ended up with a delightful mix of comfort food and springtime BBQ flavor. 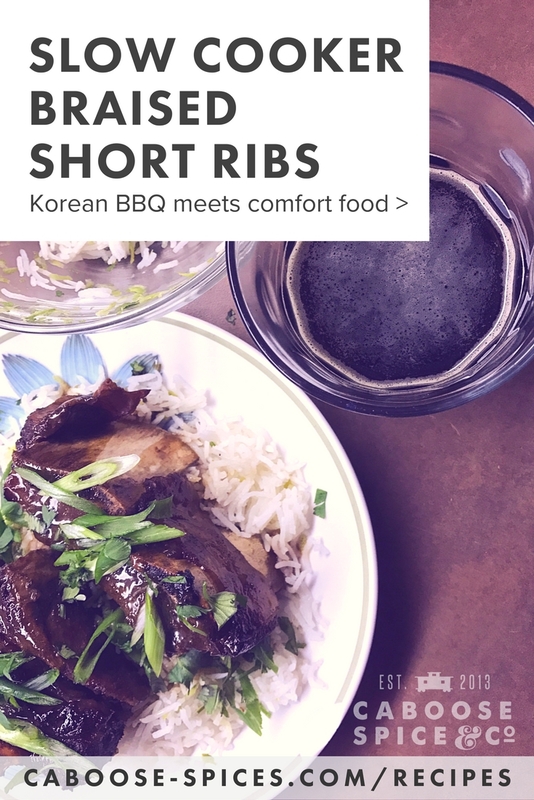 To get even more of that fresh crispness, we served these delectable ribs with a side of mild kimchi and coconut-lime rice. Season short ribs with Old No. 1 until all surfaces are covered. Place them in a ziplock bag with the rice vinegar, soy sauce*, Snowboarder Porter* **, sesame oil, and garlic cloves. Marinate for at least 4 hours or overnight, turning once. Dump entire bag of ribs and marinade, into pressure cooker or slow cooker. Set pressure cooker to high and cook for 45 minutes. If using a slow cooker, cook on high for 4 hours or low for 7-8 hours. When ribs are done, set oven to broil. Remove the short ribs to a baking sheet. Pour juices from slow cooker or pressure cooker through a strainer into a gravy separator. Allow fat to separate from juices. Brush short ribs with honey. Place under broiler for 5-7 minutes, until honey starts to caramelize. While ribs are under the broiler, pour juices into a medium saucepan. Whisk cornstarch into 1/4 cup cold water. Pour cornstarch mixture into the saucepan with the juices and heat over medium high heat. When mixture comes to a boil, turn heat to low. Simmer until sauce is thickened, about 5 minutes. Serve sauced ribs over steamed rice with kimchi. And, of course, a tall glass of Snowboarder Porter. Beer: Obviously Snowboarder Porter is not gluten free, but there are some good gluten-free beers around, like Ground Breaker Dark Ale with similar notes of chocolate and caramel. Check your local Whole Foods or natural grocery store. Soy Sauce: Substitute an equal amount of coconut aminos for the soy sauce. Cornstarch: Cornstarch is generally gluten free. However, try a brand that is gluten free, such as Bob's Red Mill (produced in a dedicated facility) to avoid cross-contamination issues.